Reddit is a place for AMAs (ask me anything), viral content, and an open forum to discuss anything and everything. More than 1.2 billion people visit Reddit every month. In fact, six percent of adults online use Reddit. These are just a few of the stats that prove that Reddit is one of the most popular sites on the internet. It’s a space that social media advertisers don’t want to miss out on. On most social media platforms, ad targeting is limited to categories like interests and regions. Reddit offers the unique experience of targeting audiences via subreddits—niche communities often related to specific interests. Each subreddit attracts a certain group people with particular interests. This is where you’ll find very specific, engaged, and often influential audiences. There are already more than 9,000 subreddits. Reddit is the world’s largest online forum—it was built for discussing, communicating, and sharing thoughts and opinions. You can host an AMA (Ask Me Anything) in your chosen subreddit, ask for customer feedback to gauge how people feel about your brand, and encourage user engagement by promoting content that interests them. For example, Nordstrom has dedicated their official Reddit handle, Nordstrom1901, to audience engagement. The retail store does this by hosting AMAs with their executive team, answering questions from users, and asking the Reddit community directly what they’d like to see from the brand’s subreddit. By continuously sharing relevant content on Reddit, you can build trust among users. When it comes time to run an ad campaign, your brand will be recognized as a trustworthy and helpful member of the community. Reddit’s self-serve advertising service—link ads and text ads—doesn’t require a developer or designer. You simply upload a photo or company logo, include a link, and add some text. There are two types of promoted posts: link ads and text ads. Link ads and text ads have the same look and feel to user-submitted posts on Reddit. You’ll notice this kind of Reddit ad has a light blue background and a “promoted” tag. Link ad—This is an external link to your website or product landing page. These look similar to headlines. Without the need for a ton of copywriting, these ads can be created quickly and easily. These are available on Reddit’s self-serve advertising platform. Text ad—This is an internal link to another Reddit page. The page your ad sends readers to can contain a longer description of your offer, external links, or links to a discussion forum that explains more about your product. Unlike a link ad that redirects to a site or landing page, text ads will always redirect to another Reddit page or post. These are available on Reddit’s self-serve advertising platform. This is your traditional online display ad, like a banner or rich media ad. If you want one of these, you’ll have to contact Reddit’s sales team. This type of ad is part of Reddit’s managed advertising program. They don’t come cheap—prices start at $30,000. Display ads on Reddit are generally reserved for those with big ad budgets, like agencies or major media buyers. Besides offering more of a dynamic ad campaign, Reddit’s managed advertising program comes with perks, like a dedicated account manager and personalized analytics reports. To see it in action, Reddit ads offers case studies on some of their most successful campaigns, including Duracell and Toyota. Once you’re signed in, go ahead and name your campaign. Note: The name will show up in your dashboard and not to users. At this point in the game, you should have created marketing personas. We suggest using subreddits as it’s one of the best ways to find and connect with a niche community on Reddit. 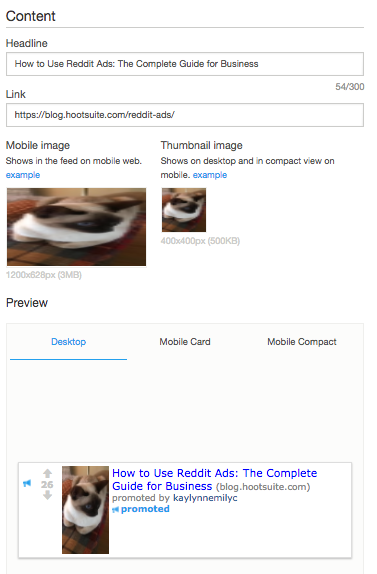 You can use SnoopSnoo or the List of Subreddits directory to find which subreddit will work best with your Reddit ad campaign. Reddit ads also lets you negatively target keywords and subreddits, meaning your ad won’t appear next to the selected keywords or subreddits. This is helpful because it means you can ensure your Reddit ad won’t be associated with sensitive topics or a competitor. 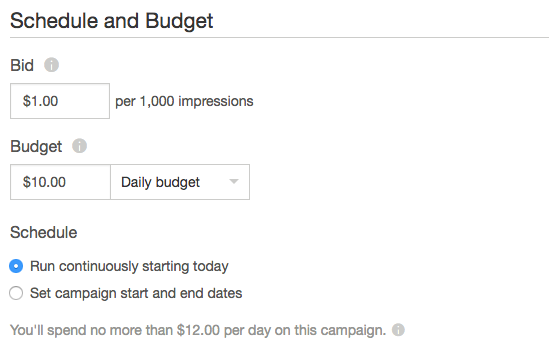 You can set a daily maximum budget or a total campaign budget. Reddit ads are priced by cost per thousand impressions (CPM), meaning you pay X amount for every 1,000 impressions. It should be noted that Reddit self-serve advertising works on a second price auction. The highest bid for a target audience wins, but the price paid is the second-highest bid plus $0.01. With that in mind, select a bid that reflects the most you’re willing to pay. At this point, you’re ready to create and submit your ad for approval. Choose the type of ad— Choose between a link ad or text ad. You also have the option to enable comments for your ad. Enter your headline—Keep it to 100 characters, and without excessive use of capitalizations and symbols. Upload your images—Upload an image for desktop, mobile site, and mobile devices in card view. Name your creative—This won’t be shown to users. This is for you to keep track of your ads. Submit for approval—Reddit will take up to 24 hours to review your ad before it goes live. Et voilà—you’ve created your first Reddit ad. Stay on top of your Reddit game. See who’s talking about your brand, manage posts, and get real-time analytics reports all from one place by using the Reddit Keyword Monitor app for Hootsuite.